Make some gifts to share around. share the spirit of fishmas. FI-III-III-II-III-III, III-III-II-II-IIII-IISHMAS!! In our little FISHBOWL! 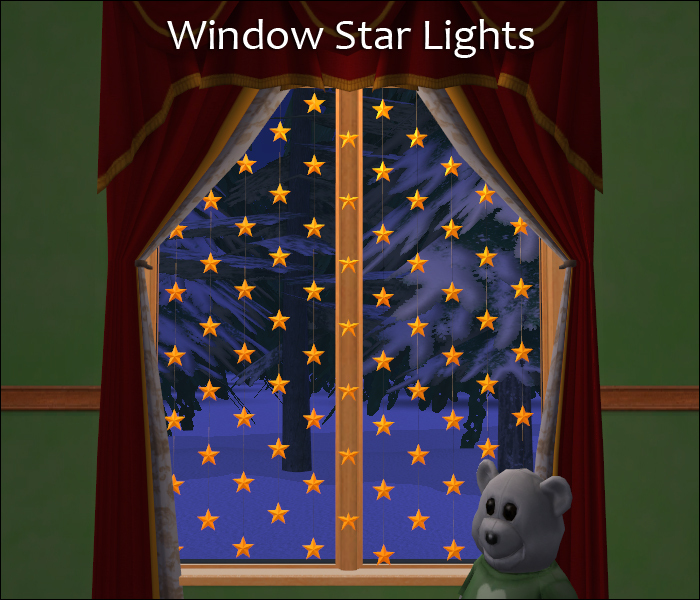 Some star lights to bring holiday cheer to your Sims' windows on those dark winter nights - or bright summer nights, depending on where in the world you're swimming. The set uses the repository technique, where the light for the short single window is the master. Both the file names and the catalog descriptions reflect this. May your days be minnow and pike, and may all your Fishmases be bright! Ooooooooooooooh and Wow! Thank you sooo much SantaFish! Oooh, shiny! Thank you, SantaFish and HelperFish! Very cute. Thanks for sharing. All the gifts have been thoughtful and great additions to the game. Thank you creators. Now today I am lost on the song is it an original Santafish?